Urban Sketchers Twin Cities June Sketch Meet will be at the Stone Arch Bridge Festival. The festival itself is great for people sketching but those interested in urbanscapes can get views of downtown Minneapolis across the river. If you want to escape the crowds than crossing the bridge to the Mill Ruins Park can be an option too. There is something for everyone here! 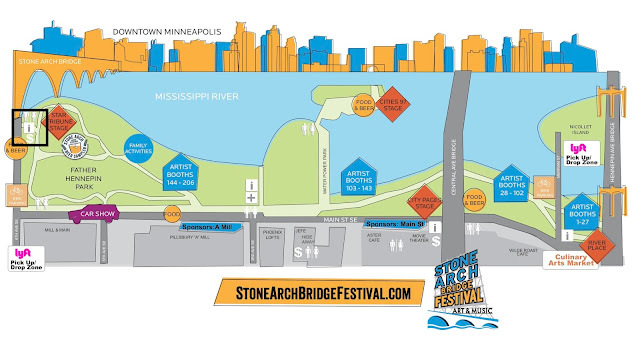 We will meet at the Festival info station at the end of the Stone Arch Bridge at 12 noon. It's circled in black on the map, below. We will return to the same location at 3PM to share our Sketches. There is plenty of great art, food, drinks and music. Those who wish to socialise can choose to stay back after 3pm and enjoy the festival as a group. PARKING: There are plenty of parking garages on either side of the Bridge. Using Apps like Parkopedia or ParkWhiz can be useful to find parking options. It is going to be crowded, so please plan ahead.